Hearing these stirring thoughts from Saint Marie Eugénie once more, we can see very well how they and the gospel for today’s wonderful feast of the Assumption – “our” feast! – line up together. Marie Eugénie’s words are not a call for us to live with our heads in holy clouds; they are, rather, a call to live deeply all that God has given to us to live. Things and events that the world is inclined to call mundane (with the implication that such things are of little value – and certainly of no great spiritual value) are, in fact, what will lead us to heaven. Think about it: a teenaged girl from a little village in the back of beyond learns that the “Holy Spirit will overshadow” her and the resulting baby will be the son of God. At the same time, she learns that her kinswoman Elizabeth is also to have a child, and is in fact much further along in her pregnancy. That girl immediately drops her life in Nazareth and sets out “in haste” for the hill country of Judea, there to immerse herself in the mystery of her cousin’s life. She “liberates” herself from her own very reasonable needs and fears in order to enter into the life of Elizabeth. Her “joyful detachment” from all that she knows leads her to trust that angelic messenger, believe his unbelievable word, and set out. Her thought is not of herself but of Elizabeth and surely of God as well. But that thought is lived out in very earthy ways – journeying along dusty roads, experiencing the discomfort of such a journey, and then entering into the life of a household that’s been turned upside down by the remarkable action of God. How many loads of laundry did Mary do while she stayed there? How many floors did she wash? How many peas did she shell or cucumbers did she slice? How many baby booties did she knit? 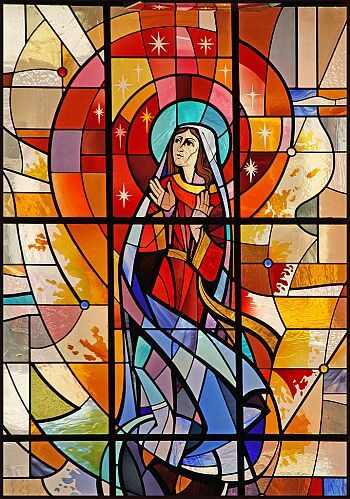 Mary’s hymn stays close to home, to earth, as it looks backward and forward at the history of her people. As it does so, it offers us a way to think about her Assumption and its connection to our lives as they are lived out right now, in the present moment. Mary says nothing about pie in the sky when you die. It’s all about God’s action in her life then and there, overflowing with gratitude, awe and joy. Her song, which we sing every night at Vespers, reminds us to enter into that movement of joy as a way to get closer to God. That’s pretty much what Marie Eugénie is suggesting as well. She’s not particularly poetic, but she is very clear when she urges us “to leave lesser and inferior things under our feet.” The list of what those things might be, including “useless words and actions, complaints, worries and worldly affairs,” resonates. She’s no puritan or Jansenist; she doesn’t say “lesser and inferior things like raising your children, loving your spouse, paying your bills, going to work, reveling in a sunset, listening to the purring of a cat, feeling the wind on your face.” Those things, earthly as they are, are not on her list. Both the worldly and the super pious among us might need to think about that a bit! And all of us might want to understand a bit more deeply that God is acting in us, in all that we are and do. Our part is to “co-operate,” that is, to work with God, as both the Virgin and Marie Eugénie did. At the same time, neither saint is inviting us to simply make a heaven here on earth. Each takes the long view – and each is deeply aware of the hand of God in her life and in the life of His people. No, through their words and even more through their actions, both the Virgin and Saint Marie Eugénie call us to live authentically – not to get away from who we are but to live more and more deeply who we are: creatures made in God’s image and likeness who will one day return to our Creator. That vocation calls for celebration, gratitude, and much joy. 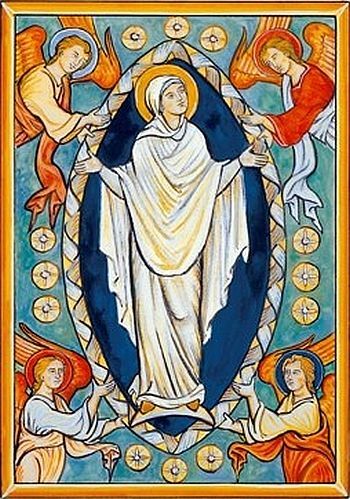 Happy, happy Assumption Day to all of us who rejoice in being part of the world-wide Assumption family of women and men!